Are your kids off for March Break? 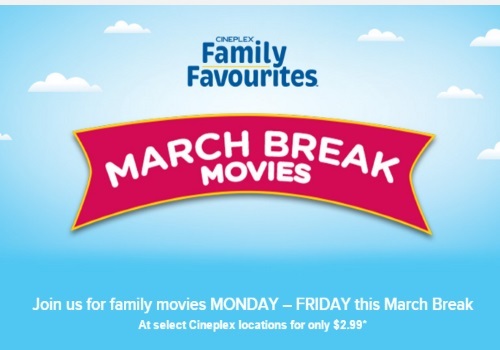 Cineplex Odeon is playing Family Favourites Monday-Friday this March Break at select Cineplex locations for only $2.99! March break varies by province, see listings below. Showtimes may vary by location. Movies playing include Minions, Paddington, The Spongebob Movie: Sponge Out of Water and Shaun the Sheep Movie.